Benno's Figures Forum • Group Build 2016 The Road to Arnhem! Entry ready! Group Build 2016 The Road to Arnhem! Entry ready! Re: Group Build 2016 The Road to Arnhem! Entry ready! Is it nice to steal a bicycle? No! Not even if you are from another era! He should pick up that rifle and shoot a warning! Nice! And a bit more modern! It will be hard to catch him. It looks like a time-trial bike and he is lying very aerodinamic on that bike! Sorry guys, but I'm out. I haven't even started painting anything, I'm still unsure if I'd been able to finish something for the competitions and it's already mid-April. I must apologize for making this confession so late, but for a long time, I thought it would be possible. Now I must be honest and tell you: no, it is not. Thank you all for the very fine entries. Kurt, your bicycle thief is a brilliant idea. Gunnar, I can add a cow if you wish. And Sascha, no problem. This should not be stress, even if it is for me . I am looking forward to see you at the FIGZ. vellek wrote: OK so here's my two-cents. It's 1915 and the French are riding to Arnhem. One weary Poilu has stopped to rest, only to find that one of his countrymen from 1415 has stolen his bicycle. Great scene! That Poilu could find out the answer to the age-old question as to whether shields from the 15th century deflect bullets from the 20th. Looking good guys, will be fun to see it all in real on FIGZ!!! Its a long way to tippeeeeehhhh Arnhem I see! Originally I had him stealing a Sherman, but reconsidered when I realized how ridiculous that would be. How many men-at-arms actually know how to drive a tank??? Oeps, then I might have a problem! Sent my little package. But there was a little confusion at the postal office. The clerk pointed at Bonn on my package and asked "Is that a city?". I am very happy that he hasn't been in charge when I have sent coffee to Dioloulou in Senegal. And they have no zipcode there either. 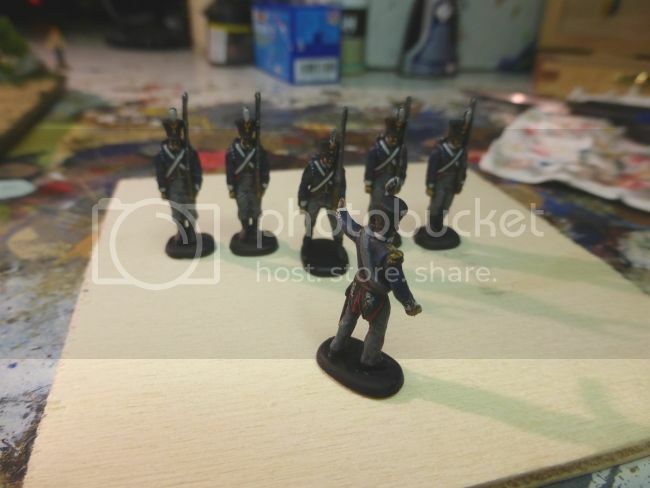 And I have a little (very small and humble) on the punishment for those mutineers that attend FIGZ, they can stand as modern figures on the Road To Arnhem. And Jan, no cow needed if you don't want it there. That Postal guy seems a bit of a twit! Or "My name is Bonn, James Bonn". But I didn't think of it. 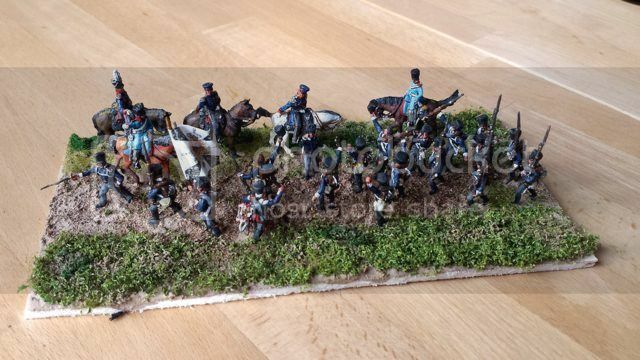 Just as well, if I had said anything like that the package would have gone to James Bonn instead of Jan.
Marvins Netherland Infantry has arrived. 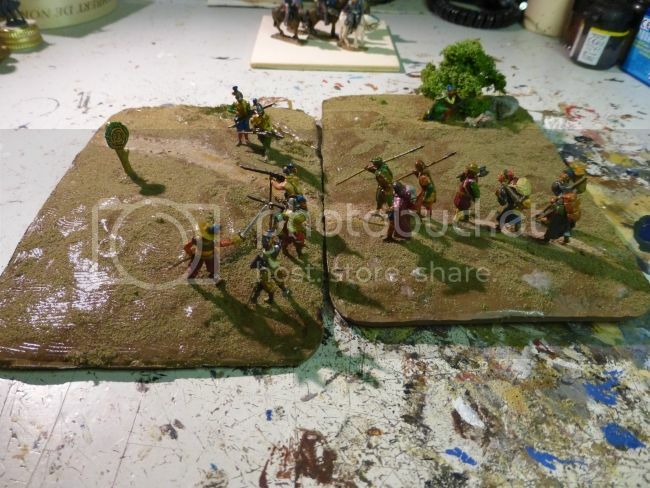 I will prepare the diorama and I already have a nice idea. I hope you will like it as well, Marvin. And Gunnars dios arrived as well. They have been damaged a little but I have fixed everything - as you can see. So no problem! But the swedish post - zero point! BTW: I am still looking for someone who wants to build a medieval marketscene and the juggler from Valdemar. Come out of the corner and be the first volunteer. I am very happy that the German post were responsible for the last part of delivery! They survived?!?!?!?!!!! Today on the breakfast table I made a quick snapshot with my mobile to show you my first entry for the "Road to Arnhem". I had time during the weekend. I have met with Konrad who gave my his Romans and after some ups of coffee I finished this small dio. I had so many figures that I decided to build a 20x10 cm base. The next thing is to start with the Red Ball Express and to finish Marvins two entries. Hope you like the Prussians and there is still time to participate. Looks fantastic Jan! What a cup of coffee can do with a man! Looks very great! I think coffee can be an important part of our hobby. Maybe even more important than beer, but I'm not sure about that.